“I had a serious problem with my scalp when I was 25… that lasted at least six months,” 36-year-old Yang said, recalling a brush with redness, scaly patches and dandruff. Yang, who had worked as a professional pharmacist for over a decade, decided independently that her skin condition had probably been caused by the brand of supermarket shampoo she was using. “I started searching for other shampoo brands that had natural elements without additives. Amazingly I felt better after changing to a new shampoo,” Yang said. Yang then founded her company last year, resolving to help all those people facing skin problems similar to her own. “Skin is the largest organ of the body, so everything regarding skin care protection plays a pivotal role,” Yang said. Yang's flagship product is hair wash powder for people with sensitive skin. 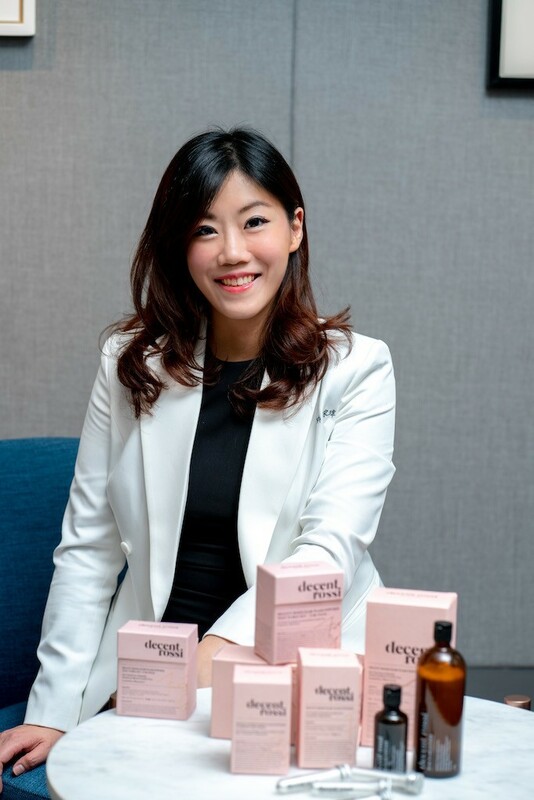 Caption: Rossi Yang, Founder and CEO of Decent Rossi presented her products. Yang explained that most hair-care products on supermarket shelves, such as shampoo, contain the chemicals Sodium Lauryl Sulfate or Sodium Laureth Sulfate. However, she explained, SLS and SLES are much more suitable for use as cleaning fluids for floors or cars instead of the human body. The main reason why shampoo makers still use SLS or SLES is that it’s cheaper. But, with the passage of time, the more SLS or SLES is absorbed by a person’s skin, the more there’s likely to be skin problems, such as itching and scaly patches. Therefore, Yang is careful about the chemicals she chooses for her hair wash powder. Sodium Cocoyl Isethionate is her main ingredient as it does not easily penetrate the skin’s outer layer and is therefore mild. Yang noted she wants to help people with skin ailments and she’s not aiming to create a popular brand for the general market. “I could also use something cheaper and create a (more) lucrative business. But, I don’t want to do something thing like that. My mission is to be a skin protector,” Yang said.